From now until the end of the year we are offering this 5 Room/Area carpet cleaning deal to the customers in our area. Additional charges for pet treatment or filtration stains may apply. 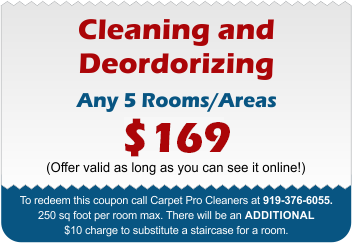 Cleaning, Deodorizing and Sanitization included. For more information on our professional carpet cleaning methods, click here. Find out more about the benefits of going green when we clean your carpets and upholstery here. Have pet stains? Nasty odors? Find out why we recommend enzyme treatment with your carpet cleaning booking here.